In decades past, American presidents apparently had hobbies other than playing golf and eating at McDonald’s. Thomas Jefferson, for one, was an avid paleontologist. As early as the 1790s (before it was cool), he kept an impressive fossil collection at his home in Monticello. So when a group of confused miners came upon some unidentifiable bones in a West Virginia cave, they sent them to Jefferson. Judging from the long limbs and large claws, the president suspected they belonged to a giant cat “as preeminent over the lion in size as the mammoth is over the elephant” and that the animal might still exist somewhere in the unexplored West. Jefferson got the size right. The description? Not so much. The animal he named Megalonyx (giant claw) was actually one of the giant ground sloths that very slowly roamed America during the last ice age. And while Jefferson later agreed with this alternative diagnosis, his error wasn’t a complete waste. The Megalonyx marked one of the first important fossil finds in the United States, and it prompted the first and second scientific papers on fossils published in North America. In honor of the president’s contribution, the sloth’s name was later formalized to Megalonyx jeffersonii. To this day, the Brontosaurus remains one of the most popular and recognizable dinosaurs in history – an impressive feat for an animal that never existed. The confusion started in 1879, when collectors working in Wyoming for paleontologist Othniel Charles Marsh found two nearly complete – yet headless – sauropod dinosaur skeletons. Wanting to display them, Marsh fitted one specimen with a skull found nearby, and the other with a skull he found in Colorado. Voila! – the Brontosaurus was born. Unfortunately for Marsh, the skeletons were later exposed as adult specimens of a dinosaur already discovered, the Apatosaurus. The error was formally corrected in 1903 by Elmer Riggs of Chicago’s Field Museum, and scientific papers haven’t called the animal Brontosaurus since. Seventy more years passed before researchers determined that the skulls Marsh borrowed really belonged to the Camarasaurus, a discovery of his archrival, Edward Drinker Cope. Pop culture, however, missed the memo altogether. Paleontology’s version of the Hatfields and the McCoys, Marsh and Cope had a nasty and long-running professional rivalry. Although they’d actually started out as friends (with each even naming a discovery after the other), by 1870 their relationship had taken a turn for the worse. A year earlier, Cope had assembled a skeleton of the sea reptile called Elasmosaurus. However, in his rush to publish his discovery, he placed the head on the wrong end, giving everyone the impression that the animal had a very long tail instead of a very long neck. Marsh poured ample salt in that wound by making fun of Cope’s error in print (suggesting he rename the animal “twisted lizard”) and constantly ridiculing it at parties and exhibitions. Given the stakes, he might as well have slapped Cope across the face with a glove and insulted his mother. As it was, all Cope could do was try and buy up all the published examples of his posterior-backwards construction. The feud only grew from there. The two men fought over allegations that, on a tour of Cope’s digging operations in New Jersey, Marsh bribed collectors to send key fossils to him. And in 1877, a part-time collector in Utah incited a whole new string of cutthroat arguing by trying to sell bones from his site to both of them. Other feud highlights included a series of snippy “he said, he said” pieces in the New York Herald and the time the Smithsonian confiscated much of Marsh’s fossil collection after Cope accused him of misusing tax dollars to hoard fossils for himself. For all the angst it caused them, though, Marsh and Cope’s constant one-upmanship was great for science. During their 20-some years of bickering, the two added 136 new species (including Triceratops, Stegosaurus and Diplodocus) to the nine that had previously been discovered in North America. Henry Fairfield Osborn was a giant in the field of paleontology, but he also has one giant mistake to his name. In 1922, while serving as president of the American Museum of Natural History, Osborn received a fossil of a tooth found in Nebraska. Suffering from a bout of overconfidence, the normally careful scientist published a paper announcing (based on one tooth, mind you) that he’d discovered Hesperopithecus haroldcookii, the first anthropoid ape unearthed in North America. Unfortunately, in this particular case, said distinguished primate got the last laugh. Upon further examination, it was determined that the tooth belonged to a millennia-old peccary – otherwise known as an ancient pig. In fairness to Osborn, the similarities between human and peccary teeth had already been noted in scientific literature, so it wasn’t that wild a guess. Of course, that didn’t stop creationists from pouncing on the mistake. Long before there was a science called paleontology, people were trying to come up with explanations for giant bones found in the ground. And often, those explanations pointed to mythological creatures. Of all the fairy-tale creatures accused of inhabiting the ancient world, the griffin might claim the most direct connection to actual fossils. Usually depicted in folklore as a lion with an eagle’s head and wings, the griffin was said to fiercely guard its gold. The hybrid animal appears consistently in the art of ancient Rome, Greece, and Persia, and its legend apparently originated with Scythian nomads who wandered east toward Mongolia’s Gobi desert. So how do fossils fit in? The Gobi is filled with the fossils of both the Protoceratops, a lion-size dinosaur with a birdlike beak, and of the similarly beaked Psittacosaurus. And while there were no massive hoards of gold around, the skeletons were often found guarding something arguably more valuable – hoards of eggs. The ancients were wrong about griffins, but that may have had more to do with misdiagnosing evidence than with legend or superstition. Herodotus is considered the world’s first historian, but he came this close to also being the world’s first paleontologist. While traveling in Egypt, he noticed that the bricks used to build the pyramids had unusual, circular shapes petrified in them. What he saw were the sediment-preserved remains of ancient single-celled organisms. Of course, what he thought he saw were the remains of lentils eaten by the pyramid builders after a hard day of lugging around 2-ton pieces of stone. Herodotus was pretty far off, but he redeemed himself later in his book Histories. In it, he noted that he saw shells in Egypt’s mountains, and rather than attribute them to a shellfish feast for pyramid builders, he correctly surmised that the animals lived in a sea that once covered the desert. “The Delta,” he wrote, “is formed of the deposits of the river, and has only recently, if I may use the expression, come to light.” Regardless, by overlooking the importance of the organisms he found, Herodotus unintentionally delayed for centuries the discovery of one of science’s most important fields. He made his observations in the 5th century BCE, and it took until the 1700s for serious thinkers to realize they were looking at extinct animals. We’re just saying, he could have saved us all a lot of time. When it comes to the battle between faith and science, it’s hard to be more conflicted than William Buckland. Both an ordained Anglican priest and a top-notch anatomist, Buckland holds the claim to fame for finding the oldest human remains on record – only he didn’t believe that’s what he’d found. As a Biblical literalist, Buckland strongly supported the notion of Noah’s flood. So, when he made a groundbreaking discovery by digging up prehistoric elephant and hyena bones in a Yorkshire cave in 1822, he concluded that they simply belonged to animals that had perished in the flood. But that wasn’t all. A year later, while excavating a Welsh cave full of prehistoric animal remains, Buckland found a human skeleton deep in the sediment. Stained red by the surrounding iron and wearing ivory beads, the “Red Lady of Paviland” was, according to Buckland, a woman of ill-repute linked to the nearby remains of a Roman camp (as it couldn’t possibly be as old as all the other bones around it). Later research identified it as a 27,000-year-old man, but Buckland was too caught up in his religious devotion to accept the idea of ancient people in his homeland (or that a man would wear such extravagant jewelry). The first time a scientist attributed a fossil to an actual dinosaur was 1677, when museum director Robert Plot identified a bone fragment found in Oxfordshire, England, as part of the thigh bone of a (human) giant. Nearly 100 years later, scientist Richard Brookes gave the unknown species the unfortunate name Scrotum humanum because, well, the fossil did resemble a giant man’s nether regions when positioned a certain way. Naturally, it was (drum roll, please) William Buckland who found other pieces of the dinosaur nearby and gave the specimen the more suitable name Megalosaurus. Don’t worry, though. Buckland didn’t abandon his flood theory; he just figured this was a really big lizard that had drowned. He did, however, make the fossil the subject of the first-ever formal scientific paper on dinosaur remains. After its discovery in 1822, the Iguanodon became one of the first dinosaurs to achieve celebrity status. Depending on whom you believe, the massive plant-eater’s tooth was found by either Dr. Gideon Mantell or his wife. Regardless, Gideon was the one who realized the fossil came from an extinct category of reptile much larger than any still around. Thanks to Mantell’s obsessive drive to find more bones, Iguanodon turned into a bit of a sensation, helped along by sculptor Benjamin Waterhouse Hawkins, who made life-size models of Mantell’s animal. Most famously, at an 1853 dinner at London’s Crystal Palace, 21 prominent scholars dined inside Hawkin’s scale model of an Iguanodon. These sculptures were true to Mantell’s description of the animal. Unfortunately, that vision was terribly, terribly wrong. Among the mistakes? The animal walked on all fours (it turned out to be a biped) and had a horn on its nose (the hornlike bone was actually a spiked thumb). 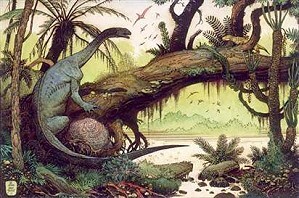 The Iguanadon has since undergone a massive makeover, as did Mantell. After his wife left him, he moved to London and became a full-time paleontologist. In 1838, he sold his fossil collection for the then-massive sum of 4,000 pounds (about $20,000). There’ve been plenty of hoaxes in paleontology, from Piltdown man to the Cardiff Giant. Yet what makes the story of the Archaeopteryx so painful is that it wasn’t a fake at all. The animal’s crime? Sharing features with both birds and dinosaurs, and being discovered around the time that Darwin’s On the Origin of Species was stirring up so much trouble. The first Archaeopteryx fossil was found in 1860, and it was nothing more than an impression of a feather. Though initially skeptical, German paleontologist Hermann von Meyer verified that it was an ancient feather – but maybe not from a bird. So, a month later, when the same limestone quarry yielded a headless reptilian skeleton with the imprints of attached feathers, von Meyer looked pretty smart. While a number of key scientists needed to see it for themselves before believing the thing was real, other anti-Darwin paleontologists (most notably Andreas Wagner of Germany and Sir Richard Owen of Great Britain) jumped at the chance to dismiss the animal as a full-on reptile rather than a step on the evolutionary path to birds. But they were wrong. Later, when the clear reptile-bird link became indisputable, anti-evolutionists went from nitpicking the classification to calling the whole thing a hoax. As recently as 1990, physicist Lee Spetner famously (and falsely) claimed that the feathers were added to a reptile fossil by making impressions in cement and adding it to the mix. Despite efforts to smear their good name, six Archaeopteryx skeletons have now been found, all with the same bird-reptile blend.